Check out the USATF Airfare & Hotel Discounts! The San Francisco Bay Area is very convenient to access by air. There are three airports that feed our area: San Francisco International Airport (SFO), Oakland International Airport (OAK) and San Jose International Airport (SJC). There are many direct flights to San Francisco from key cities of Chicago, New York, Boston, Seattle, Phoenix and many more. 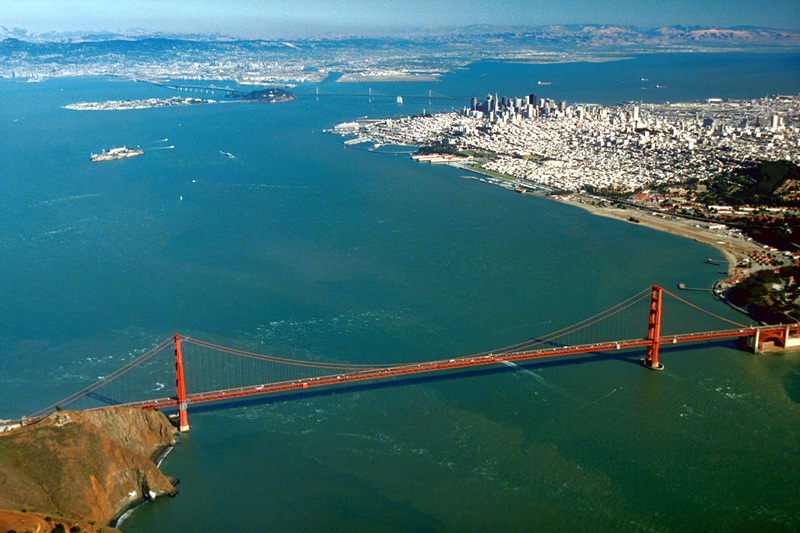 San Francisco: a destination city extraordinaire! From the San Francisco Airport, we have the Bay Area Rapid Transportation (BART) that is immediately accessible from the airport via the people mover to BART without freezing or going through parking lots. It is sheltered from the wind and cold. BART takes you directly downtown in 25 minutes so that you can transfer to the San Francisco Municipal Railway system, the best in the US. The 30 Stockton bus stop is just across the street from the host hotel, Holiday Inn Fisherman’s Wharf. If you arrive in Oakland International Airport, you can take the BART Shuttle from the airport to connect to BART heading west to San Francisco. On BART, you will experience going into the “tube” in the San Francisco Bay arrive to the other side in San Francisco. At this point, you can also connect with the 30 Stockton at Kearney and Market to Fisherman’s Wharf to the stop at Columbus Avenue and North Point. The San Jose Airport is a little further away and one can rent a vehicle to drive one hour up to the City to the hotel. A really great trip planner website is transit511.org. packed with information about getting around San Francisco. From the Holiday Inn Hotel and Sheraton, you can’t help but visit Fisherman’s Wharf, Pier 39 and walk to Aquatic Park. Over the hill at Aquatic Park, which is half a mile away from the hotel, one can see the beautiful Golden Gate Bridge. If one walks east of the hotel, half a mile, one can visit the sea lions on their rafts barking away. During the holiday season, the tall Christmas tree is brightly lit at Pier 39. Visiting downtown is easy. Simply hop on the 30 Stockton bus southbound at the corner of Columbus and Bay, across the street from the Holiday Inn. Stay longer to see more sights of San Francisco. We would recommend a bus tour that brings you to the seven hills of San Francisco. There will be no race shuttles from the hotels to the race venue. Ride-share, Muni, Uber, Lyft, and rental cars are all available. Hotel to Golden Gate Park is about 20 minutes by car and there is plenty of parking there. It will be very inexpensive to ride share with other runners and/or team members. Rental Cars: There are three or more rental car agencies at Fisherman’s Wharf within walking distance of the hotels so athletes can do a one-day rental and return. From Golden Gate Park to the Awards Ceremony at 2500 Mason St.
Running in San Francisco: Simply Spectacular! If you were to take a left out of the hotel, you can stay on the sidewalk and almost continuously without a break in your stride for five miles to AT&T Park where the 2010 & 2012 World Series Champions The San Francisco Giants play. On this run, you will caress the San Francisco Bay on your left, the Ferry Building, the Piers and run under the Bay Bridge. If you were to take a right from the hotels, you will be heading out to Aquatic Park, over the Fort Mason hill to the Marina District. Here you can run along the Marina Green to Crissy Fields and can go out to Fort Point at the base of the Golden Gate Bridge. You will see Sausalito, Tiburon, the Marin Headlands and be at the bay side of the Golden Gate National Parks and the Presidio of San Francisco. The hotels are located at one of the most beautiful areas of San Francisco.